Infinite Art Tournament: At the Movies: "The Fall"
Mrs.5000 and I have thought of The Fall as one of our favorite movies since we watched in on the big screen in 2006, but we hadn't seen it since. I remembered it mostly as a visual treat, packed with strange and exotic images. I had forgotten that it is also a sweet and moving story, featuring one of the most charming performances ever put in by a child actor, Catinca Untaru. It is an eccentric movie, but very entertaining and extremely lovely to look at. Aside from lukewarm marketing -- the posters are not great, and the title could be better -- I am at a bit of a loss as to why it did not become an international blockbuster, or at least generate a more substantial cult following. It's a truly beautiful movie. Plot: At the front end of the 20th century, two patients meet in a Los Angeles hospital. One is a stunt man, bedridden after a serious accident during a shoot. The other is Alexandria, a little girl from a Romanian migrant family, her arm badly broken during work in the orange groves. They befriend each other, and the stunt man begins telling the girl an elaborate and meandering story -- an "epic," he promises -- drawing inspiration from his life in the movies and people they see around them in the hospital. As the stunt man tells his story, we begin to see it played out in the vivid imagination of the girl, distorted by her innocence and by her incomplete mastery of English. This play-within-a-play, a swashbuckling adventure yarn, is shot in extravagant colors. Its characters perform feats of daring-do against a succession of dazzlingly beautiful landscapes. It is a simple enough tale, but its premises are very fluid, because details of plot and character are constantly being negotiated between teller and hearer -- Alexandria has ideas of her own about what makes a good story -- and because, as events progress, the "real world" begins to intrude more and more into the fantasy. Visuals: The opening credits play over vivid black-and-white slow-motion shots of some kind of trouble on a railroad bridge; we will eventually realize that we were seeing the stunt man's accident. These images set the tone for the photography throughout the movie. They are quite lovely, combining Henri Cartier-Bresson's eye for incident with Ansel Adams' crisp monochromatic spectrum, and nudging them gently into moving life. The Fall's Los Angeles of the 1910s is reproduced with exquisite care, with sets, costumes, and props conspiring in a setting that is somehow both historically plausible and on the verge of the fantastical. The strange landscapes of the story, on the other hand, are riotously surreal from the get-go -- and yet the film was filmed entirely in real world locations, with a bare minimum of computer effects. 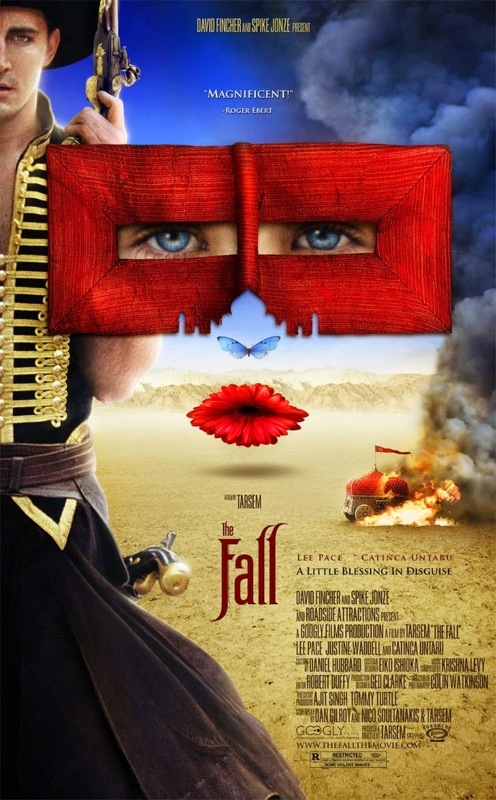 In terms of sheer visual magnificence, The Fall is unlike any other movie I have seen. Dialogue: Although much of the charm of the movie comes from the affection between Alexandria and her grown-up friend, much of the dialog is about how little they really understand each other. She is a child, blind to entire categories of adult issues and wrestling with English to boot; he is consumed with his own concerns, and does not always look out for the well-being of his young friend. A detail: The Fall gets Alexandria's broken English exactly right. Movies in general are terrible at this, and if you have spent much time around people who are learning the language you can tell that most scriptwriters have not. Alexandria's Romaniglish is spot-on perfect, and I have to think that Catinca Untaru really was learning English while the movie was filmed, and given lots of freedom to make a hash out of her lines in the printed script. The effect is delightful. Prognosis: The Fall is one of my very favorite movies. Michael 5000's imdb rating: 10.